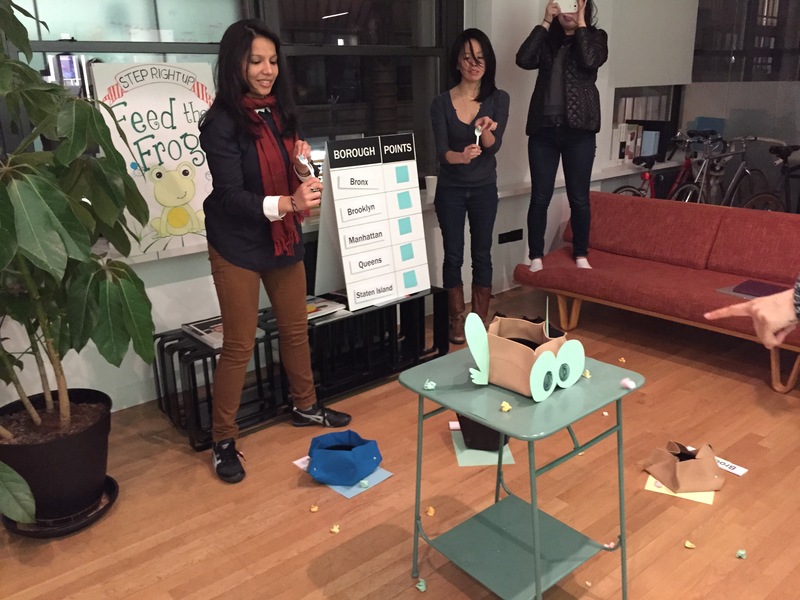 There was a learning curve with the game, it wasn’t easy to ‘catapult’ paper balls into the frogs mouth. People got creative with their strategies on how to get the most paper balls in given the allotted time. Luke, for instance, kept his set of paper balls in his shirt pocket so he didn’t bend down and reload each time. Is there someone we can assign to collect the paper balls that end up on the ground instead of the basket? 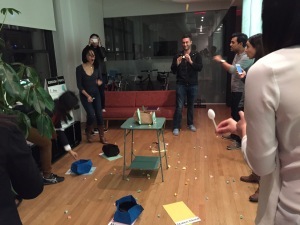 Some players ran out of paper balls and had to restock by running around picking them up. the game was fun and intense. It created a lot energy and excitement not only for players, but for the viewers of the game too. This week, class began with each group presenting their Calvino design fiction. Then Michael walked us through some examples of design deliverables and gave us a tour of ESI. Finally, each group shared and got feedback on their slide outlines. Each group completes a final iteration that represents the culmination of their idea and post documentation by Sunday. Please focus on the prototype this week, since the final presentation will not be due until the week after next. 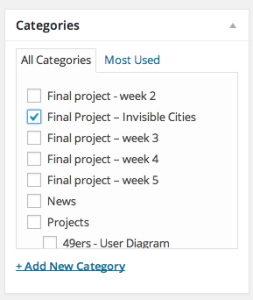 File your documentation under the Final project – final prototype category. …And you know that in the long journey ahead of you. when to keep awake against the camel’s swaying or the junk’s rocking. you start summoning up your memories one by one, your wolf will have become another wolf, your sister a different sister, your battle other battles, on your return from Euphemia, the city where memory is traded at every solstice and at every equinox. Michael showed us some mock ups he’s been working on covering a broad range of design process phases in public spaces. Aastha, Matt, Melody and Nga delivered tech presentations. Finally, each group give an update about their latest iteration and showed their user experience diagrams. Shared Dropbox folder for tech reports – Want access to people’s tech report slides for thesis reference and/or further edification? Sneha had the lovely idea of creating a shared folder in Dropbox. Visit the tech reports folder and please add your slides to our growing library! Playtests next Saturday – The folks at ESI are showcasing their new gaming theater in a playable (but still private) ‘beta’ state through a series of 30 minute sessions. Sign up to participate in a session on Saturday, December 6, ongoing from 12–10 PM. Invisible Cities (due Sun, 11/30) – Each group re-craft their design for one of the worlds created in Italo Calvino’s Invisible Cities. Please post under the Final Project – Invisible Cities Category. As a reminder for how to add your post to a category, I’ve included a screenshot below. Compile final presentation outline (due in class Mon, 12/1) – Print a draft of your final presentation slides for next class. While you don’t need to fill in the exact content just yet, you should include the core components of your presentation — things like title page, creation myth and user flow diagram. Be sure to have each component printed on a separate piece of paper so we can pin them up and reorder them. 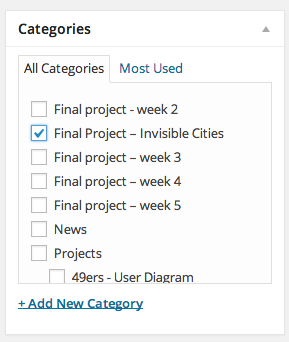 When you create a new blog post, check the “Final Project – Invisible Cities” category on the right panel before you publish. 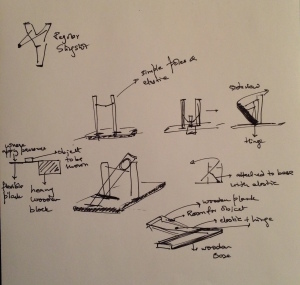 This week, our prototype story is brought to you by Instagram. 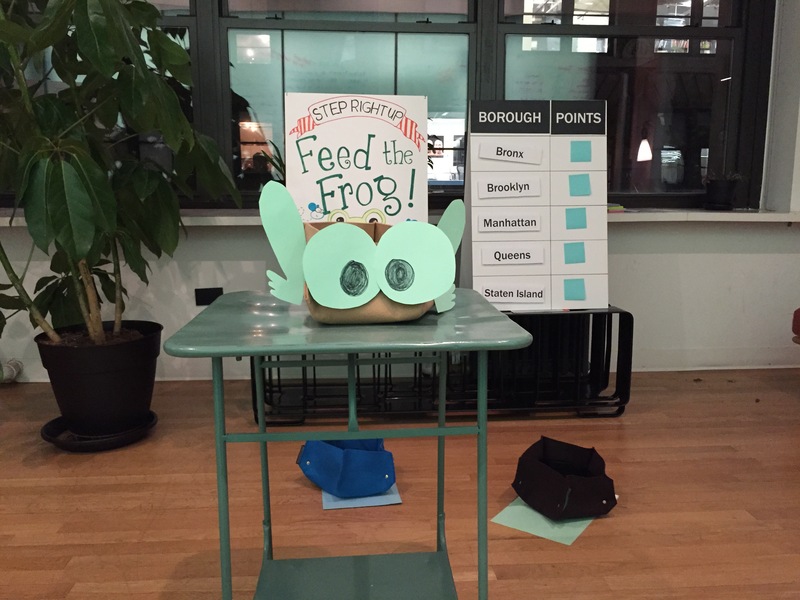 Please take a look at feedthefrognyc. We unfortunately forgot to capture shots of our large signage and 5-borough scoreboard — will update this post as soon as we can get a few photos of them since they did play a role in attracting our audience! Michael shared some of the prototyping work he did the previous week, and recommended the Society for Experiential Graphic Design for anyone who might be interested in getting involved in a local community that’s focused on experiential, physical, and technical design in physical space. 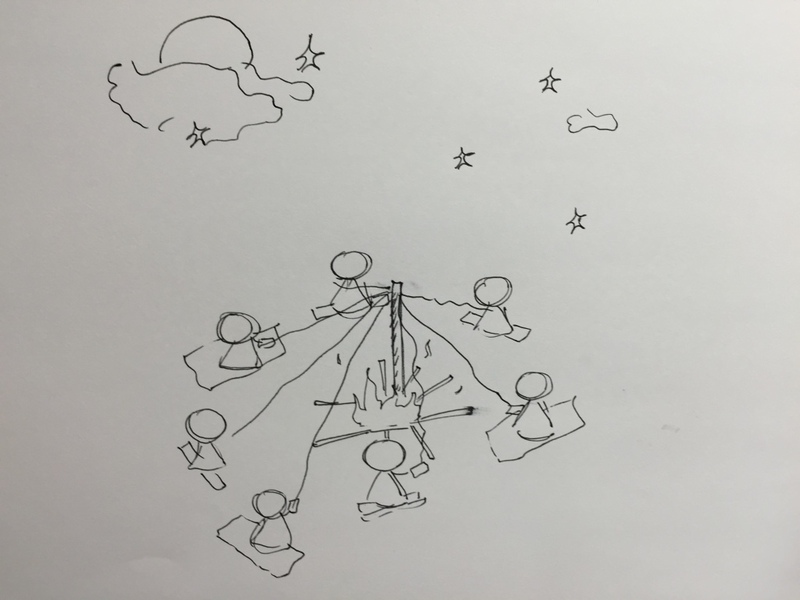 We also discussed our learnings from Pete’s lecture, listened to tech presentations, and did an in-class exercise to help each other brainstorm new ideas for our concepts. Iteration 3 – Get together and discuss input and ideas from in-class design swap. This is time to start doing a hard convergence. Choose a gem or something that has caught your interest most and start honing it. Find a day this week to go out and do your second to last iteration. Create clear goals to test against. Plan how you will be documenting your prototype. Please post your documentation to the Final project – week 5 category no later than Sunday. 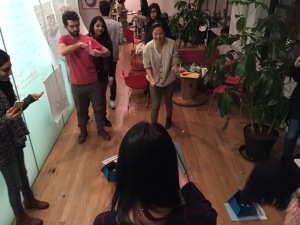 Last week’s class on gaming was very useful for our team. We were so excited about the idea we came up with in class that we’d like to focus our next prototype on trying it out! Here is a writeup about our game concept: Feed the Frog. The concept still manages to fulfill our 2 main goals, which were to bring people together in the park in a new way, and to make people feel like kids again through a nostalgic game. 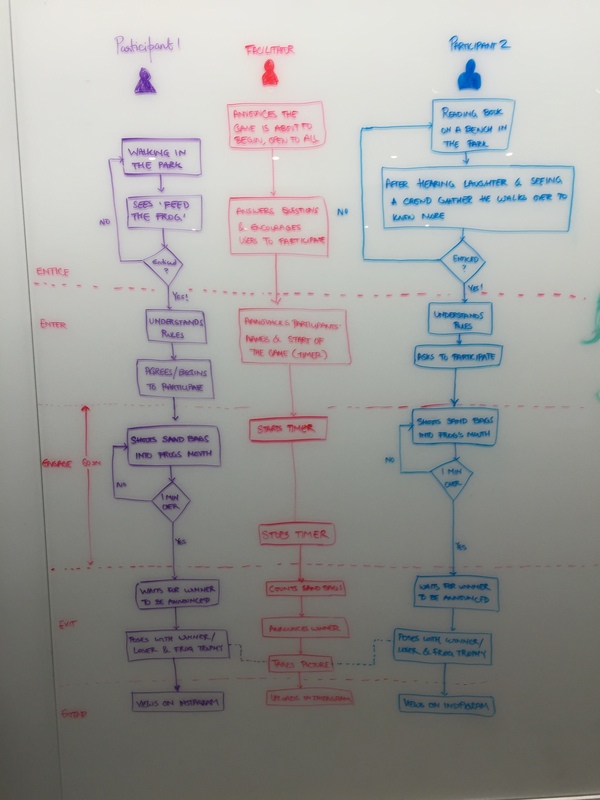 This flowchart demonstrates how 2 users move through the game over time, while a third “facilitator” plays a role in organizing and officiating the competition. 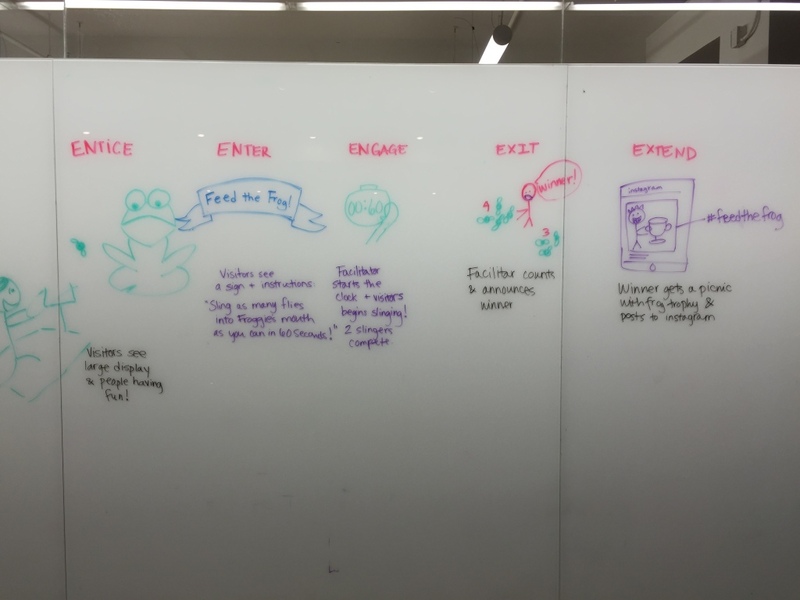 This little storyboard demonstrates key interactions throughout a user journey. Pete Vigeant gave a fun lecture about game design and each group participated in an exercise involving creating a game concept for the public space in which they’re working. Please create user experience diagrams for the next iteration of the prototype you’re planning to do. The diagrams should take two different users and walk through the experience. They should indicate the passage of time and any other characteristics of the environment that change and affect the experience. If there are multiple users involved, it should indicate their interaction. Please post your diagrams no later than Sunday, and add them to the Final project – week 4 category. In addition, Aastha, Matt & Sarah will be presenting their tech presentations on Monday. Michael announced that next week he’ll be away and we’ll have a guest lecturer who specializes in creating public gaming experiences. Mikey, Amy, Michie, Mini, Jeff and Hanna presented their tech reports. Michael had individual meetings with each group to review project status and create plans for completing projects. 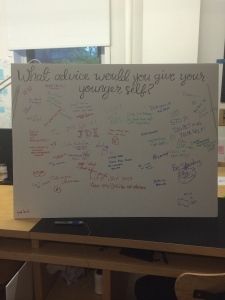 This week you will do your second iteration based on what we talked about in class. Write a series of goals that you want to understand through your testing. Go back to your original goals and parameters to make sure that they are aligned. Take a photo or plan of the location that you are working in and highlight the spaces that you are activating. 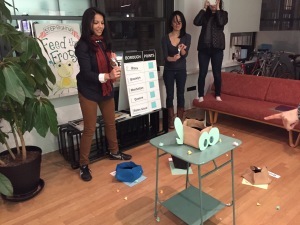 First set up your second iteration at SVA IXD floor let it run for at least 24 hours, ideally 48. Please post documentation no later than Sunday, 11/9 and file it under the Final project – week 3 category. Sam W., Sneha, and Sunnie are scheduled to present their tech research reports next week as well. We installed a big poster with a colorful grid of post-its in the elevator. 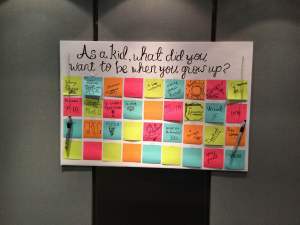 The question asked, “As a kid, what did you want to be when you grew up?” The post-its gave each participant a small but open space to write or doodle an answer, and being in the elevator provided a time constraint. The poster was full within an hour. We made another poster that had no constraints on it and invited free-form responses to a more complex question: “What advice would you give your younger self?” First we installed it in the foyer of Floor 7, only to find that someone had later removed it in angst. Apparently there was a rule against posting in that space that we didn’t know about. 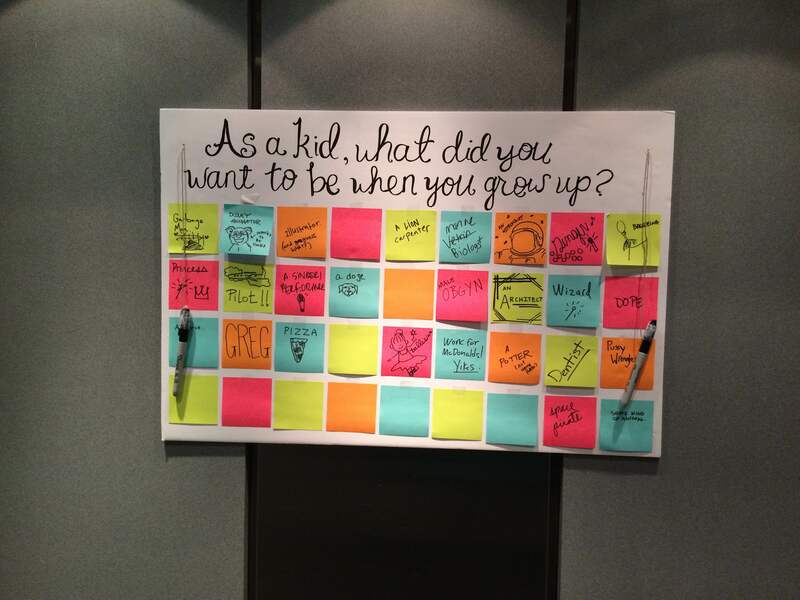 Then we placed the poster in the elevator and found it filled with responses later in the day. week 6 – wrap up and document – create video? High Line Bling Presents… Secret Service!